From Spurgeon’s Morning by Morning devotional book, for June 1. “It is one of the arrangements of Divine providence that day and night shall not cease either in the spiritual or natural creation till we reach the land of which it is written, ‘there is no night there.’ What our heavenly Father ordains is wise and good. You can read the whole (short) devotional here. The current print of the book is in more modern English. This is probably going to read like a summary of this whole blog, but it is what it is. My baby boy turns 12 weeks on Monday, and every.single.day. I still look at him and can’t believe he is here and he is my baby. I can’t believe that happened to us — which is ironic, because in our years of infertility I would so often think, I can’t believe this is happening to us. But he’s here. A living and breathing testament of the hardest season in our life so far, and of the faithfulness of God in mercifully bringing us through it. I once thought after all of this was over, I would just put it behind me and finally move forward with our life. I’ll get over it and move on. Surprisingly (or not), I can’t really get over it. I mean, I’m not obsessed with it. I’m not always talking about it. I’m not about to become the Infertility Awareness spokeswoman. But there’s no denying that it’s a part of me. How can it not be? I’ve written over and over about how this is a sanctifying work. If it changed me so much (and boy, did it! ), how could I ever just forget about it? It’s so clear to me now how much this trial reshaped me. 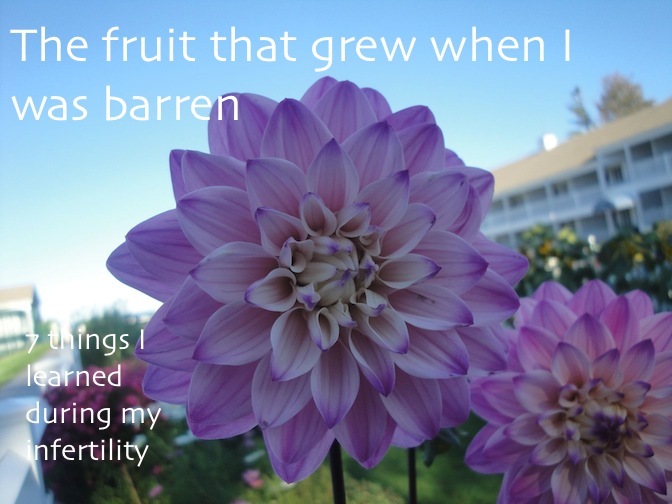 If for nothing else than my own reflection, I’d like to share with you some of the biggest lessons I learned in my infertility. 1. This isn’t my baby. When I was about 9 weeks pregnant, my husband and I were casually preparing to go out to dinner with some friends. Out of nowhere, I discovered I was bleeding pretty heavily. Panic washed over me like never in my life. I screamed for my husband and broke down sobbing. We prayed hard, pleading with God not to take this baby yet. I remembered calling out, Father, you may ask a miscarriage of me some day with some baby, but please don’t make it today or this baby. I ended up on bed rest for a month, and, obviously, God was merciful and our baby was fine. Now that he’s here, like all mothers, I spend a silly amount of time sneaking in to check on him while he sleeps. Our first few nights home, he slept like a rock, but we lost tons of sleep jumping up every 10 minutes to make sure he was ok. I still pop up a few times a night just to peek over and see his chest moving. The scary thought has crossed my mind a few times: What if I come in one day and he’s not breathing? The lesson from both of these stories, and every other worry my new-mom mind conjures up about his life, is the same lesson I learned when I was waiting for him. This is not my baby. We are daily Abraham standing with his long-awaited Isaac, ready to give him back to the Lord whenever He may require it. Of course we could stand here close-fisted, in constant terror that we could lose this dear treasure at any moment. 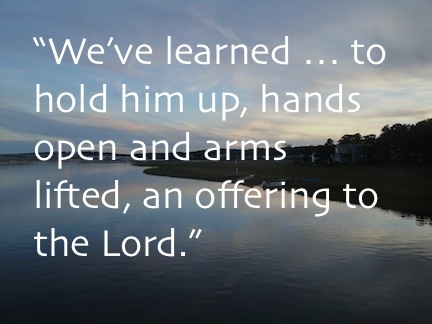 But instead we’ve learned (and continue to learn) to hold him up, hands open and arms lifted, an offering to the Lord. There is so much more peace in this. This is the Lord’s baby, and we trust Him to do with him as he wishes. 2. Compassion. I’m a little embarrassed to say I used to be a pretty compassionless person. I think I had compassion on the really poor and needy, but with the everyday person like me, I just didn’t care that much about their problems. I probably cared about my friends’ troubles, but if I was honest, I didn’t care that deeply. But now that I’ve had true troubles of my own, He has transformed the way I think about what others may be going through. I’m less quick to judge. I cry more easily at their pain. I’m more patient with their struggles. I’ve stopped gauging how serious I think someone’s trial is — if it’s really that bad. If it’s that bad to them, then it’s that bad. It was that bad to me. I regret that this wasn’t my heart sooner, but I’m grateful the Lord has brought me here. 3. God is trustworthy. This is one of the first thoughts that crossed my mind when we saw that surprise positive pregnancy test. Wow, He actually did it! All that time I was hoping He would — I was trusting He would — but there was no way to be sure He would. Having that confirmation has totally changed the way I pray and how I see Him. I thought I had faith in prayer before, but now it is no longer blind faith — I know that He can do it. I’ve seen it with my own eyes. I remember thinking that morning that, even if He took the baby the very next day, this would change everything. It was no longer praying and getting back silence. He had heard and acted for us. And now I know He could do that again, about anything else we ask of Him. This has changed our relationship with Him so much. 4. Nothing is hopeless & impossible things can happen. Like many of you, l bet, last summer we sat in a fertility clinic across from a doctor who calculated the percent likelihood we had of conceiving a child on our own. I kind of forget now (it’s not the kind of thing you store up in your heart), but I think it was something like 9%. Now, my husband is in economics, so he’s a little more knowledgable about statistics — in fact, him not liking the way the doctor “tweaked” his math to come up with that number was a big reason we changed clinics. Nevertheless, we knew our odds were looking grim. It only looked worse when our treatments later failed. But then one day, we were pregnant. It happened. By all calculations, it wasn’t likely. But it did. Since then whenever we’re asked to pray for seemingly impossible things, I am so much more optimistic (read: faith-filled) — I was there when it wasn’t supposed to happen, and I was there when it did. So why couldn’t it happen again? 6. Really terrible things can happen to me. I guess this is kind of a strange thing to call “fruit,” but I see it as part of a sober mindset. Knowing how to “number my days” and have an accurate estimation of my life as a vapor. We always think it won’t be us. God wouldn’t do that to us. I wouldn’t be the one whose baby dies from SIDS. My husband wouldn’t be the one who becomes a paraplegic. My mom wouldn’t be the one who gets horrible cancer. “God forbid,” we say. But God may not forbid, if it’s for our better. For the sake of making me more like Christ, nothing is off limits. The first step in handling it well is not living in denial of its likelihood. NO! We have long had everything, because we had Christ. 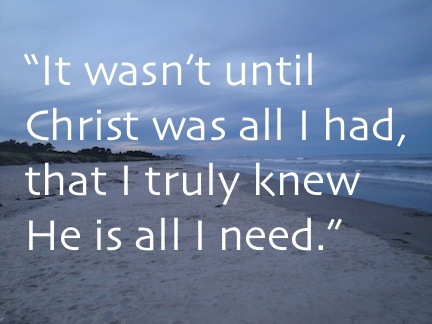 Then we had everything in Christ. Then everything else was undeserved mercy. 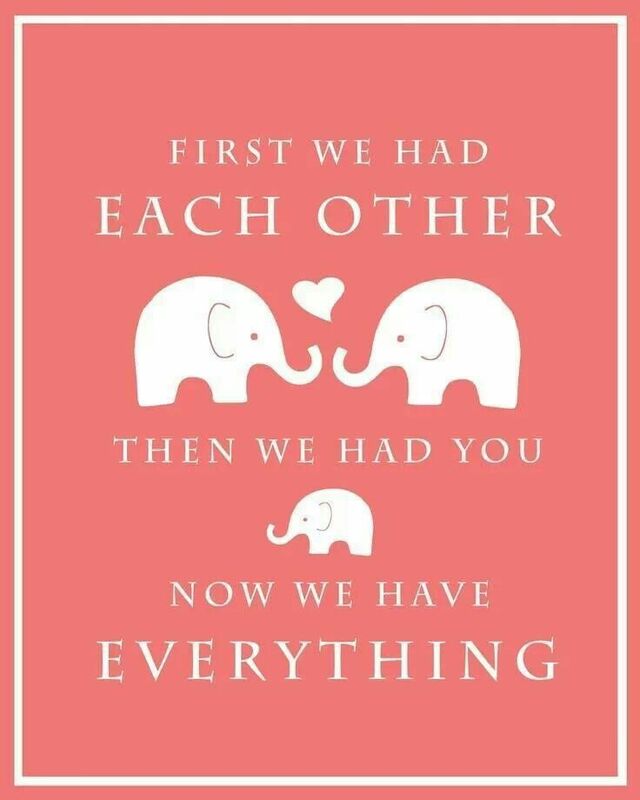 …But I guess that doesn’t look as cute in a nursery. I live in an area with a largely non-Christian population. When I was first coming to accept that we are on a road of infertility, I began asking myself a question I think most Christian woman in similar circumstances are drawn to ask: How can this be used for God’s glory among others? At first glance, anyone would think that it brings God the most glory to bless His followers with children. Especially in the non-Western culture where I live, children are seen as a sign of God’s blessing on your life. I struggled at first with God denying us this fruitfulness, because I felt like it make Him “look bad” in front of these non-believers. Now they’ll mock us because they can say You don’t bless us, I would pray, Please, Lord, this isn’t helping our case very much! I know there are many women all over the world who, when faced with infertility, would say that they will stop at nothing to have a child. No expense can be spared, no price is too great, to finally hold that baby. But what if, in the midst of this, you stood in stark contrast, saying, “What I have is enough. Christ is enough“? How would those around you respond? And what would be their impression of Christ then? I don’t want this to be interpreted that there is a line of “too far” that you can go or “too much” you can pay to conceive, but I do challenge you, if you haven’t already, to ask the Lord to grow your heart to honestly say: In Christ, I have enough. Reposted from August 27, 2013. …I shared the other day about my realization that this trial isn’t going to end with a baby. It could end later, if I let it, or it could end sooner. It’s all about my heart and what God is doing there. So if that’s true, what is God doing there? Where do I need to be to feel like we’re past this? God has surely done a lot in these years of barrenness… many lessons have come and gone, but some deep ones always press. For me, it’s peace with God’s plan for my life, even if I don’t always like it. It’s being content with not having kids and “the dream.” It’s in the What if He always says “No”? It’s resting in the chance to have a spiritual legacy, even if I don’t get an earthly one. It’s the chance to be spiritually fruitful for the Kingdom, even if we can’t be physically fruitful on earth (blog post to come!). I haven’t decided yet, but it may be about accepting God’s will for us to grow our family through adoption instead. Your things may be different, and my list may keep growing. But right now, I know I can generally answer the question of, “What could I do to end this trial?” with the things I just said. So the real question is: Why don’t I end it? And the awful answer I keep discovering in my heart is a solid mixture of I just don’t want to (aka… I haven’t in fact learned those things yet), and, much worse, an invented idea that if I do find that peace and accept those plans, I will surely be “giving in” and God will see that I’m content without a baby and I’ll lose all hope of getting one. If I keep kicking and screaming, He won’t forget me. He’ll see how bad I want it. But if He thinks I’m content, He’ll leave me this way. This is the cousin of “jinxing it” … an animistic idea that we’ve invented, that if we do or think or say certain things, it will spoil our chance at something else. As if those words or actions or thoughts have any real power, let alone more power than God. So we don’t Pin baby things on Pinterest. And we don’t daydream about baby names. And we don’t let ourselves talk in the definite about having kids in the future. And we don’t get our hopes up. And we don’t let ourselves learn or accept contentment. Because what if we lose our chance? But those are complete lies. Why do I know that, but struggle to let it go? Doesn’t God know my heart? (Yes.) 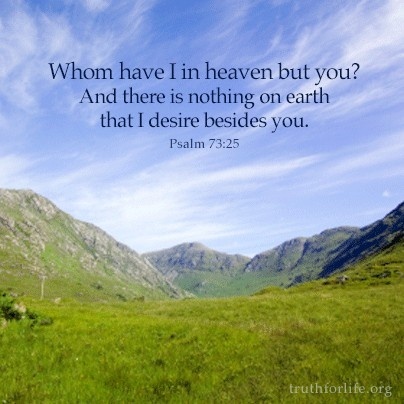 Doesn’t He know my deepest longings? (Yes.) Doesn’t He care? (Yes.) Don’t I trust Him? (Yes.) Don’t I want to be more like Him? (Yes.) Don’t I want to learn that contentment? Not really. But I want to want to. I think I want to, until times like this when the rubber meets the road and it’s time to put my money where my mouth is. “Didn’t you say you want to be more like Christ?” I hear myself say. Yes, but I didn’t consider the cost. Sometimes it hurts, really badly. And I don’t know how this blog post ends. It’s one of the questions that keeps me up at night. This is where I always land. I should let my heart move forward, still hopeful, yet content. Content to be childless forever, if God wills. Content to adopt, if God wills. Content to whatever, if God wills. I should, and I want to be willing, but I’m still holding out just a little bit for the best of both worlds. And I know it’s the recipe for disaster that you see in a movie and start yelling at the screen. And I’ll kick myself later. But today, I land here again, waiting for God to keep working in my heart and my life. Grateful that at least His mercies are new every morning, and I get to try again tomorrow at this sanctification thing. I’ve been thinking about the essence of the little saying above. The things you take for granted someone else is praying for. When I see that, my first, black-hearted reaction is to think, “Hear that, all you baby-havers? So stop complaining about your kids’ sleep patterns and hug them!” Then I realize the quote is talking about me, too. I stop and think about which things I take for granted that someone else is praying for, the same way I’m praying for a baby and other mothers don’t seem that grateful for theirs. And a lot comes to mind. When I started college, I didn’t realize it was my dream to get married when I graduated. I don’t think I realized how close graduation was. It was only months after I got married that I realized I really got off easy. It was definitely my vision as a little girl: go to college, get married, find a job, have babies [ahem], be a great mom, live happily ever after. But I wasn’t the girl working hard on her M.R.S. degree in college … God just allowed me to meet my husband early on, have lots of romantic memories getting to know him, get engaged my junior year in Christmas snow, and get married within days of graduation. I was even hired for my perfect job in the weeks between college and marriage. It kept getting better, too… our life plan had been going exactly as written. Jobs, paying off debt, going into ministry. It was best-case scenario from day one. Bam. Everything I ever wanted. And it wasn’t until later that I realized how much I took it all for granted. I don’t know what I would’ve done if it hadn’t happened like that… I think I had been assuming all along, “Of course it’s going to happen this way.” (Which, cue the “a-ha!” moment, probably explains why I reacted to infertility like being run over by a truck.) I was spoiled by God. I had gotten everything I’d ever wanted, and hadn’t really even prayed for it. So then there’s this thought. 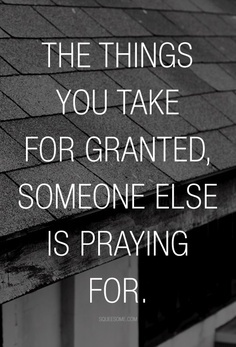 The things you take for granted someone else is praying for. And I recall the initial months after college, when my gratitude finally caught up with me. I had several close friends who were single, and it was painful for them. They were trying to figure out how their life was going to go when their plan wasn’t happening. I don’t want this post to read like: Well, at least you’re not single. What I mean is, for the first time I can really relate to the feelings they would confess to me, and it pushes me to stop taking my marriage for granted. They were terrified as each passing month and year felt like their life slipping away without them. They were praying, How long, O Lord? as He seemed to stand by silent. They felt like lesser people. They felt passed-by. They wavered between moving forward whole-heartedly with the hand they were being dealt, and waiting patiently for God to still come through. Some of them still are. And now that I know what that really feels like, I’m ashamed it’s taken me this long to be truly grateful. And I’m grateful for the reminder to look around in my life for other trials God has spared me from — which I overlooked, because I was too spoiled to consider it. This chance for ministry, these material things, a healthy, loving family back in America. I could count them all here, but it would be too personal. I hope God can use my reflections to challenge you as well — which things are you taking for granted that are currently someone else’s trial? Someone posted this article on facebook today, and it goes perfectly with my post from two days ago! Life begins today, my friends! Click to read. Here is another gem from The Valley of Vision, a book compiled of old Puritan prayers. My husband and I have been reading though it, praying with and reflecting on one prayer a day. I already have a feeling I’ll be sharing a lot from this lovely little book! teach me to be pleased with it. are thy hands and fingers taking hold of me. to honor thyself by me, and by all mine. If not, let me resign myself to thy wiser determinations. If you loved that as much as I did, you’ll love the one we read yesterday. It’s posted on this blog: The Great God. This isn’t going to be a popular post. I’ve been thinking about this subject for a while, writing and rewriting my thoughts, changing my mind. But I feel obligated, seeing such a lack of truth-based teaching and encouragement on the web, and people reading this blog for some. I’m sure I’m not your only source for that, but if you’re reading, I feel compelled to speak truth, even if it hurts a little. Everyone’s favorite passage, 1 Corinthians 13, reminds us that “…love is not jealous…” — and we are commanded to love each other, over and over again. It’s true that jealousy is not loving. When we express frustration over someone getting pregnant before or more easily than us, we are really just saying, “No one deserves to be happy if I’m not/until I’m happy.” That’s so unloving. If you are to love your neighbor as yourself, shouldn’t you be wanting for her the things you want for yourself? Let me answer: yes, you should. And if this doesn’t come naturally, that’s not an excuse not to do it. It’s a reason to cultivate that within yourself. In our life goals as Christians, we look to God’s ultimate command: “Be holy just as I am holy.” This should be the end aim of all we do. We want to be holy [ie, sinless]. I don’t think there are conditional clauses to this. It’s not “Be holy, unless it hurts really badly,” or “Be holy, unless this keeps going on forever,” or “Be holy with the first three women, but after that you can just give up,” or “Be holy as long as someone else’s situation is the same as yours.” No, you guys, we don’t have an excuse for why we “get to” or “deserve to” be jealous. Paul talks of his attitude during struggle, in another great verse everyone over-quotes out of context. I have learned in whatever situation I am to be content. I know how to be brought low, and I know how to abound. In any and every circumstance, I have learned the secret of facing plenty and hunger, abundance and need. I can do all things through Him who strengthens me. He says he learned to be content — he wasn’t naturally content. He learned to face these circumstances. He worked at it, learning from his situation and learning to be holy. Paul had some tough situations, too, so don’t pull the old “Well he didn’t have it as hard as me.” We can learn a lot from Paul’s attitude and aim of holiness, by letting go of our sinful inclinations and excuses, and controlling our hearts and minds to choose holiness over sinful envy. Today is a double-encouragement kind of day. I’m sharing two songs with a similar theme. The first is “Gratitude” by Nichole Nordeman. This is an older song that I remember loving and posting on my dorm wall way back in college. I really cherish the very Biblical idea of praising God for what He gives, and being content with it. This song speaks of redefining our idea of a blessing — it may not always come in the material things or feelings we long for, like shelter or peace [or children], but in His not granting those things, we often gain much more valuable blessings. Here’s the song, with the lyrics. The second song also speaks of looking for the blessings in trials and waiting, which are often to be cherished above the thing we are waiting for. I’ll be honest, the reason I am posting this with another song is because I think it sounds a little cheesy. The first time I heard it, we were at a retreat, and I kind of giggled and rolled my eyes at the “raindrops” chorus… but when it was over, I looked over and saw my husband was teary-eyed! The next day when they sang it again, I really listened to the words and it sunk in deeper. So even though I still think it sounds a little cheesy [and later I got my husband to admit that he agrees! ], the meaning is deep and really speaks to me. I especially relate to line about “a thousand sleepless nights” — amen, and amen! My friend, I have one big, life-changing truth to suggest to you: If you can see your trial as more of a blessing than an awful curse, and take the time to see what God is using it for in your life, I can promise you it will make the days and months more bearable and [almost] welcomed, compared to the dread and misery you would otherwise face. Ok, enough preaching, here’s the song. It’s called “Blessings” by Laura Story. I know there are many women all over the world who, when faced with infertility, would say that they will stop at nothing to have a child. No expense can be spared, no price is too great, to finally hold that baby. But what if, in the midst of this, you stood in stark contrast, saying “What I have is enough. Christ is enough”? How would those around you respond? And what would be their impression of Christ then?